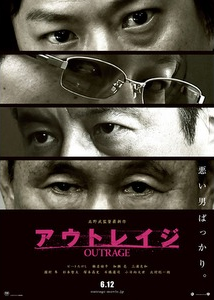 OUTRAGE is a gangster genre film that follows some of the inter-workings of the Yukuza of Japan. It's the traditional mob movie with 'The Chairman', heads of families, underbosses, street goons, and of course, corrupt policeman. Director Takeshi Kitano wants to show the downright gritty and evil side of the mob scene. With most movies like this, there's a protagonist that the audience seems to pull for and somewhat understand. Not here. Sure, there are a few characters we spend more time with, so we have a bit deeper understanding of their (re)actions, but in the end, everyone is a bad guy. They're all corrupt, evil, and greedy. For some, this might sound like an interesting watch, but not for me. This movie cemented that I just don't care much for the mob genre. Not only are the characters unlikable, but the story was very lackluster. The basic plot is each family, and subsets, are trying to one up each other by threats, "visits", and picking everyone off one by one. There's a constant struggle between everyone, loyalties are tested and destroyed, and in the end, I'm not exactly sure what the whole point was. To be the number one family? Why? It seems that once you make number one, someone is behind you trying to take you down. In the end, it seems pride is the determining factor of staying on top. One strength of the movie was the certain "ways" these men made sure the other wouldn't talk. There's one specific scene with a tongue that comes to mind that makes me squirm just thinking about it, and no, it's not what your mind automatically jumped to either. There's also some nice dark humor thrown in to break up the mood, but not enough to salvage the movie for me. Overall, I just found myself not caring about the story or characters at all. Whenever someone was killed, I had almost no investment in their character, therefore I had no visceral reactions. The many characters became muddled together, and by about half way through, I lost track of who was on top and who wasn't. The movie could be worth a watch to see the more gruesome scenes, but for me, the whole experience was very lackluster.